Welcome to Joyce Vending, your source for friendly, dependable vending & office coffee! It's all about you at Joyce Vending & Food Service, where we pride ourselves on a long history of good old fashioned, dependable service. 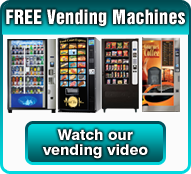 Since 1984, our family-owned and operated company has had the privilege of serving businesses and organizations throughout Akron and its surrounding areas with an outstanding vending and office coffee service. At Joyce Vending we welcome the fact that each customer has different needs!